Kelly has now gotten the skim coat on the ceiling. Next step, patching and sanding – then on to the window trim scraping! 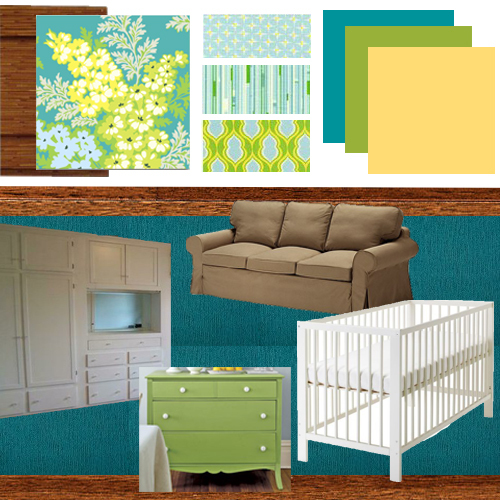 Ok, I should probably give a few more details on the nursery inspiration board I made. The first thing I should mention is that we are planning on finishing this room from floor to ceiling. Like the majority of the rooms in our house, the ceiling has a “popcorn” texture which is just downright awful. We plan on scraping the ceiling, patching and painting it. We will also rip up the carpet and refinish the floors. The baseboard and window trim (which was most likely painted with lead-based paint and is flaking off) needs to be scraped and prepped for new paint. We will also need to replace a few broken or cracked panes of glass as well as re-caulk the rest of the panes in our almost 100-year old non-energy efficient, but gorgeous windows. 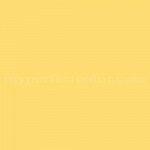 See this gorgeous yellow color? These are Behr’s Peacock Feather and Bamboo Leaf, respectively, again we will color match them and use Benjamin Moore paint. The green will be for a beat up old dresser we bought off of Craigslist which has great bones. It will be the changing table and go along the wall to the right as you come in the door. Why buy a changing table when you can use an old dresser which has storage too? The blue color will show up in the back of these little nooks which were created when a previous owner took out a chimney (the previous fireplace was in the kitchen downstairs…) We will also trim out the front of those shelves, as they are a little unfinished. The closet will most likely lose the door (otherwise there isn’t much room for the dresser on that wall) and have a curtain hung there instead. 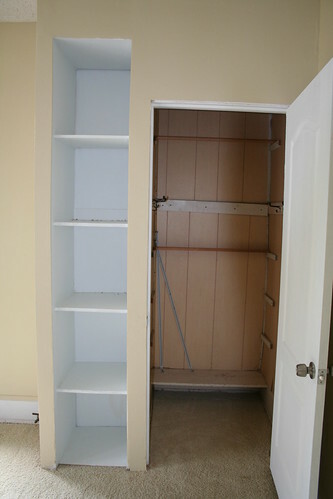 Hopefully we can get a new shelving system in that closet as well and paint the paneling – white probably, but who knows. 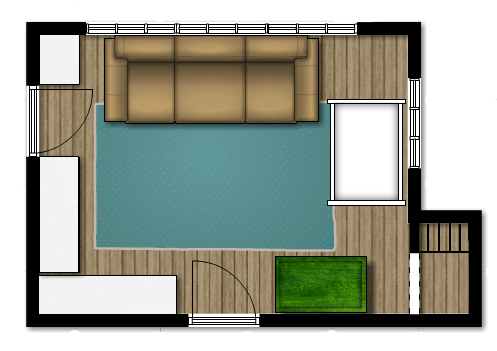 Oh, and that lovely teal blue color will also show up in the rug, which we hope to create with FLOR carpet tiles. We will use some of those fabrics for the closet curtain and crib skirt and probably some pillows or something too. 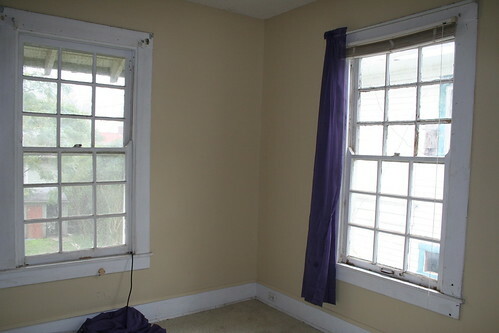 In order to get maximum darkness in this room with so many windows, we will also install some dark brown bamboo shades, which are from Home Depot. The shade of brown is to ground the room a bit more and to connect with the floor color as well, which will be a medium tone brown. Let’s see, what else is there. Oh yes! The crib. That one is easy-peasy. 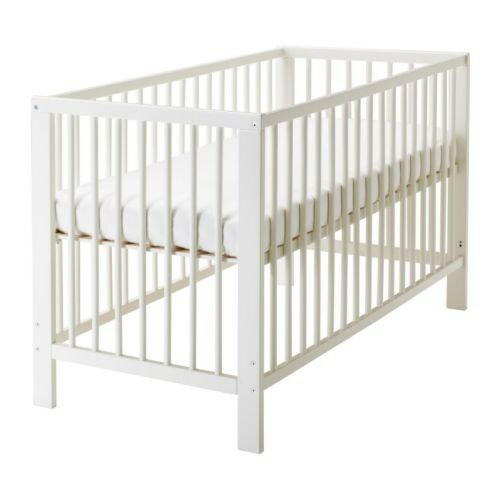 IKEA’s clean lined inexpensive Gulliver crib. Simple is best, in our opinion. 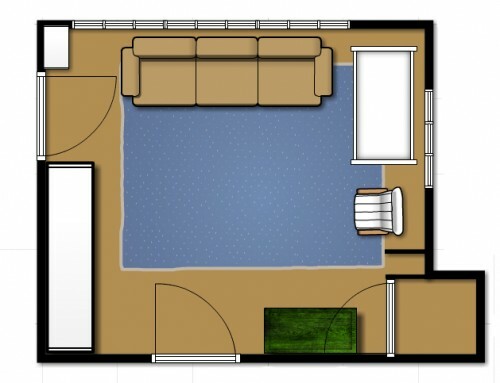 We will also move one of our current living room couches (the one with the pull out bed) up to the nursery, slip-cover it in tan and put it in front of the long wall of windows. Now, one of the biggest projects in this nursery plan (besides all the prep work of scraping the ceiling, trim, etc. 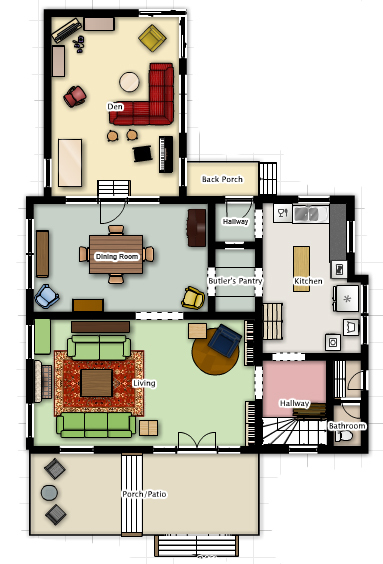 which we hope to hire out…) is something that will most likely not get done before the baby comes. It’s that other section of wall to the left of the door. 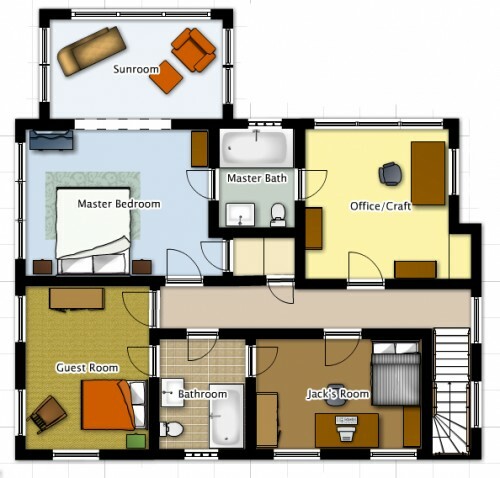 We want to design and build a whole wall and a half of built-in storage. Closets/storage is at a premium in this house and so adding some built-in storage would be a very good thing. Plus along that left hand wall by the door to the bathroom is an exposed heating duct. Not a great thing for a nursery, so we will enclose it within the built-ins. Oh, and the built-ins will all be painted a crisp white. So, that’s the design plan in detail. What do you think? I know, I know, we haven’t even finished up a bunch of old projects, much less blogged about the progress we’ve made – on the stairs, on the driveway gate… However, this project is very important and has a strict due date for finishing! That’s right – a due date. 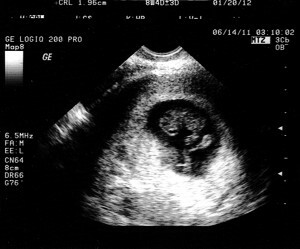 Baby Kellen will make his appearance on or about January 22, 2012, so we’ve got a nursery to create! I’ll go into detail in a further post about what exactly we are going to have to get done in this room (newsflash: it’s a LOT!) but here are two pictures for you to contemplate in the meantime. 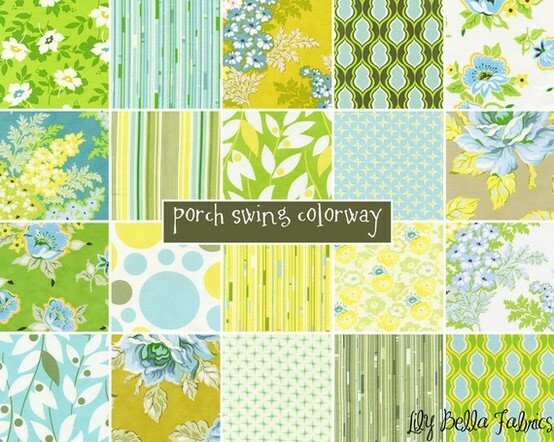 This color scheme is so happy and bright, and I chose it even before we knew we are having a boy. I think it works just as well for girls. possibly board & batten walls in the dining room? 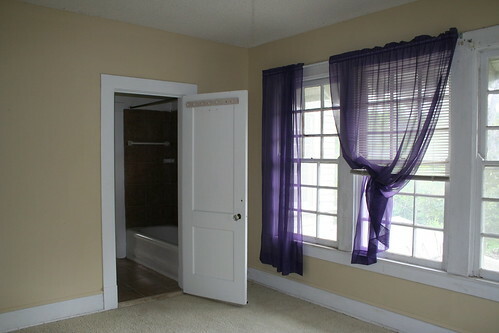 Paint all rooms, fix trim etc. Oh, and of course, finish the stair project! Could our list get any longer? I really don’t think so… This doesn’t even include the outdoor projects (i.e. the jungle that is our backyard and the almost ramshackle-y two story shed that needs fixing up.) We seem to have been focusing a lot of attention on the outside – particularly the front yard – lately, but that’s just because it’s prime gardening season around these parts. However, another outdoor project got shoved to the front of our to-do list recently, so you can look forward to Kelly posting about building a driveway gate – whenever he finishes it! By the way, if you’re a new(ish) reader of our blog, don’t be shy, say hi! What kind of projects do you have on your list?